I was delighted to hear that David Friedel, Juan Carlos Pérez, and their team have discovered a tomb at El Perú-Waka’ that they can convincingly argue is that of Kaloomte’ K’abel, one of the Maya ladies of the Péten’s past that really seems to have had some power. I kind of cringed at how the media focused on the “Maya Warrior Queen” idea: it makes her sounds like some sort of Greek-style Amazon in the jungle rather than the leader of a city-state. However, she bore a (probably symbolic) title that indicated warrior status and the reporters have to give the public what they want, right? Anyhow, the far far far more exciting thing is that she is a known, named Maya individual who can be linked to a specific burial and this is remarkably rare in the Maya world. Sure you would think that the elite Maya, who wrote their names on EVERYTHING, would write their names all over tombs but somehow it didn’t play out like that. Including this tomb there are only five Classic Maya tombs which can be associated with a named individual according to David Freidel. 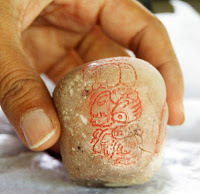 There are a lot of factors at play here but, because this is an illicit antiquities blog, I’m going to go right out and say that we only have five identified individuals in Maya tombs because every archaeological site in the region was horribly looted to feed the international illicit market for Maya antiquities. Sure it isn’t the tomb of Pakal, identification-wise, but it is a lot more than usual. Cleveland Museum, love the electric saw lines. But you all know that. I’m preaching to the choir here. I’m not really sure why the whole idea of museums with large looted objects offering copies for on-site display surprised me so much. 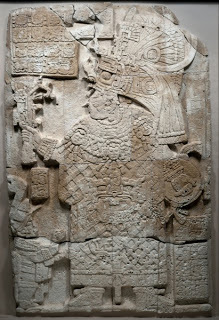 Indeed, it is actually quite normal to see replica stelae at Maya sites. 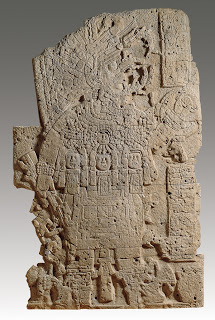 The reality of the situation is that many stela that were never looted are now in site, regional, or national museums in their countries of origin and not propped up where the Classic Maya put them. This is not only because they might get nicked, but because of the damaging effects of the jungle environment. They get rained on. lines are sad! In the Kimbell Art Museum. So in a perfect world in which the beautiful depiction of Lady K’abel was left standing where she wanted it placed (and not hacked to bits with a saw, trafficked into the United States, and bought by unscrupulous sorts at the Cleveland Art Museum), I, as the typical El Perú-Waka’ visitor,5 would likely see a replica of the stela at the site. That is provided that the money was found to transport the stela to a Guatemalan museum and to make a replica of course. I wouldn’t be seeing the real thing. Is the Kimbell’s theoretical replica any different? I think so. The obvious: it doesn’t right a historic wrong, it doesn’t make the removal of the stela any less illegal under Guatemala law,6 and there isn’t a one-to-one correlation between ‘stela at site’ and ‘stela at museum that the people of Guatemala could conceivably go see’. It certainly doesn’t address the larger questions, like why on earth any self respecting museum or art collector would be party to the buying and selling of beautiful monuments that had been literally sawed into pieces specifically for transport onto the market. That isn’t loving art. Anyhow, I think the really interesting difference is the shift in who pays and what that means. If this replica ever happens, that would be the Kimbell actually spending money to try to make a bad situation (a site without stelae, a stela without context) marginally better. By doing so, they are sort of admitting that they are culpable for whatever harm their acquisition of the stela caused. Admitting fault is step one, no? Better than nothing. Y’all know me, I think that the Kimbell should probably give back the whole stela, pay for a replica, and, I don’t know, apologize directly? But that isn’t going to happen anytime soon. 3. four years on, Kimbell…where is the replica?! 4. big surprise! See But wait everyone, there are other antiquities on the Cleveland Museum website!